Honestly, there are no words. Nothing I could say that would do this fabulous pasta dish justice. But if you’re in the mood for a big bowl full of hearty, comforting pasta goodness, then these Saucy Italian Noodles are for you. I really do love it with the spicy Italian sausage, but if you prefer something more mild, I’m sure it would still be delicious. 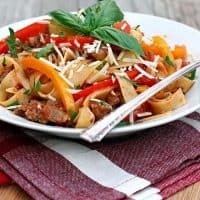 The pappardelle noodles really are the perfect pasta choice for this dish, but if you can’t find them, try looking for a wide fettuccine noodle instead. As a huge pasta fan, I have to say this is truly one of the best pasta dishes I’ve tried in a very long time. Prepare the pappardelle noodles according to package instructions; drain. Meanwhile, heat 2 tablespoons of olive oil in a large saute pan over medium-high heat. Crumble the spicy Italian sausage into the pan in small chunks, and cook until just browned. Add the onion and cook for about 5 minutes or until onions are golden. Add the garlic, salt, Italian seasoning and black pepper, and stir to combine. Add the sliced bell peppers, and saute for about 2 minutes until peppers are just tender. Stir in broth and cook until reduced by half. Stir in the diced tomatoes with their juice, and simmer for 3-4 minutes to blend the flavors, then remove pan from heat. Drizzle with the remaining tablespoon of olive oil, then stir in the chopped parsley and basil. Add the cooked noodles directly to the sauce, toss gently to combine all of the ingredients. Season with additional salt and pepper, if needed. Sprinkle with Parmesan cheese before serving. 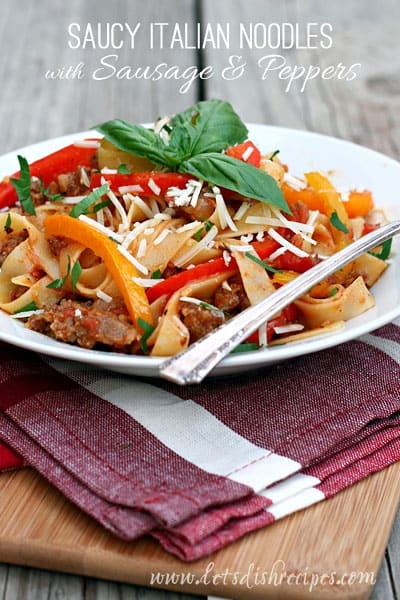 My hubby is obsessed with pasta and with spicy food– he would love this!! Well- YUM! It’s gorgeous too. Love the vibrant colors- makes me want to dig right in.